At Tara's flat, she performs surgery on Steed's injured bowler. Men of the aristocracy are being implicated in murders through damning evidence—too much evidence, as a matter of fact—courtesy of a creative blackmailer with a weakness for fine paintings. Reasonably well done. Difficult to find fault, really, except that it's such a bland, straightforward sleuthing tale that it could have been a Cathy Gale episode—the decision to return to "realism" is clearly in evidence here. 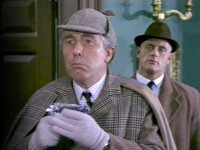 About the only bit of silliness was the detective named Sir Arthur Doyle. A former flame for Steed added a touch of spice—perhaps to give him someone a bit closer to his age to ogle. 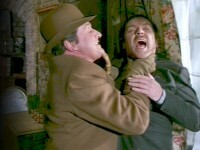 This was to be the fourth episode produced by John Bryce, under the title "The Murderous Connection" (the other three being "Invitation To A Killing," "The Great Great Britain Crime" and "Invasion of the Earthmen"), but two days into production Brian Clemens and Albert Fennell returned to replace him. D.P. Paré writes: "The Sir Arthur Doyle character was of course a reference to Sir Arthur Conan Doyle and his character, Sherlock Holmes. But you'll find another reference to a mystery writer when you read the credits. Three characters are named Earle, Gardiner, and Stanley. Well, the creator of Perry Mason, as well as writer of mystery novels and short stories, was none other than Mr. Earle Stanley Gardner! More subtle and clever than the Doyle reference, but harder to pick up	while watching the episode." Anthony Bate made a guest appearance in the Police Surgeon episode, "Under the Influence...?" Burgess' house was actually the Edgwarebury Hotel—see On Location for a present-day view. Elstree Studios car park was also used as a location.